please that they can email to me? My manual is Mk2 User Manual 12232 1958 and says that info will be included in a later edition...... grrrrr. still show 1958 with the update info under that in small print. Scroll down and view what I posted, then. It may be what you need. Sorry but no. Those are the external stowage diagrams. The manual shows both those and the internal stowage diagrams and specifically states they are not to be used for CES purposes as they only show a few of the items. Freeserve shut down their email service in May last year, which is why you got a bounce - nothing personal! I too have that edition of UHB & the one that preceded it. As you know there is quite a good CES type of list incorporating some TOTE in Chapter 3, which I think is the best you will get as I can find no trace of a stand alone CES. 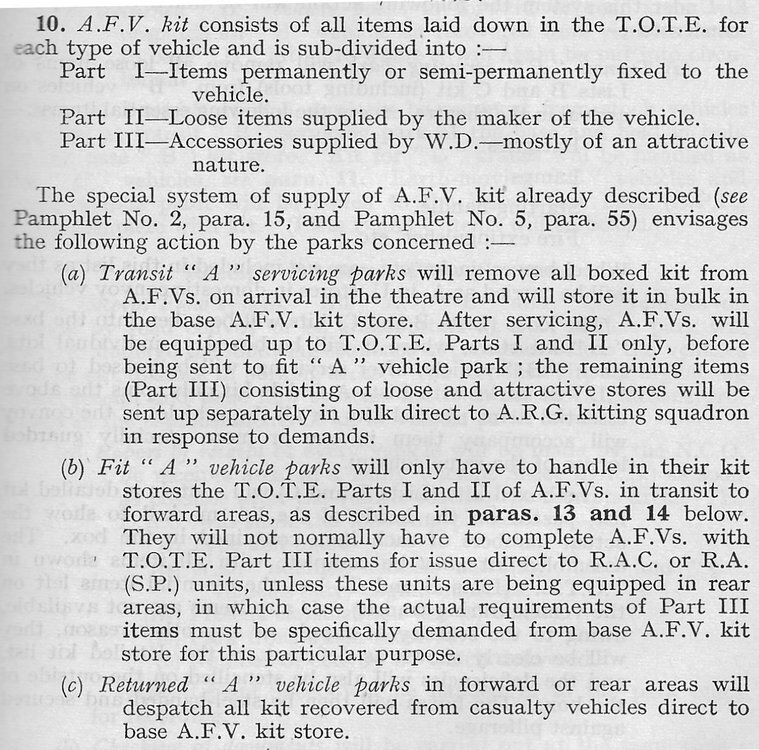 Looking in my Catalogue of Army Publications AC No.12123 Part I 1974, it lists the UHB, as you say as AC No.12232 as the 1958 edition but with Amendments 1 to 9 incorporated. My 1958 original incorporates Amendments 1 to 4 up to 13/7/60. So presumably there would have been any CES updates in there. CES are listed in AC No.12123 Part V. The earliest edition I have is 1984 & there is no CES listed for Saladin, you might think there wouldn't be by then but the CES for Daimler Armoured Car & Centurion are still listed then. Going back to AC No.12123 Part I 1974 under Vehicle Stowage Diagrams it lists Saladin as AC No.12856. So that is the one to look for, so it suggests the UHB would not have any diagrams as such & at best an updated CES as it looks as if no stand alone CES was published. Unfortunately I don't have 12856 the nearest I have is 12854. Thanks Clive for your efforts. Does anyone have 12856 please? Could someone tell me what CES stands for please? ie, all the extra bits needed to make the vehicle an operable weapons system and operational as a crewed vehicle. ie, something was "new" (when it was made) but is now old, but that hasn't been used. So lets says you come across a Scarf mount for a Brisfit BE2 WW1 fighter, never issued, no wear. So it is new in the sense that it hasn't been used. But if made in 1915 then you can't really say it is new. Hence why "NOS" rather than "New". item. Shuttleworth had been thinking more along the lines of a project to torment the aero apprentices. Thanks for that, I did Google it first but had a large choice of definitions to pick from. ie, something "new" (when it was made) but is now old, but that hasn't been used. So lets says you come across a Scarf mount for a Brisfit BE2 WW1 fighter, never issued, no wear. So it is new in the sense that it hasn't been used. But if made in 1915 then you can't really say it is new. Hence why "NOS" rather than "New". Unissued old stock might be a better term. Clive. Very true. However our American chums seem to have swamped the terminology and NOS is one of their favourites. Essentially a sort of forerunner of CES (of its various forms), which is why my Saladin UHB makes no reference to CES. Then of course there are things like FAMTO & ETS that were also casualties. Richard I think he needs them in a hurry for tomorrow. The trouble is not sure which way the earth is currently spinning, so is his tomorrow the same as ours or has it already started? Doug I'm not sure if my emails did get through as the internet connection is variable here, but I've sent photos of pages 111-122 that don't appear in your copy. Hope they a) arrive b) are of some use.